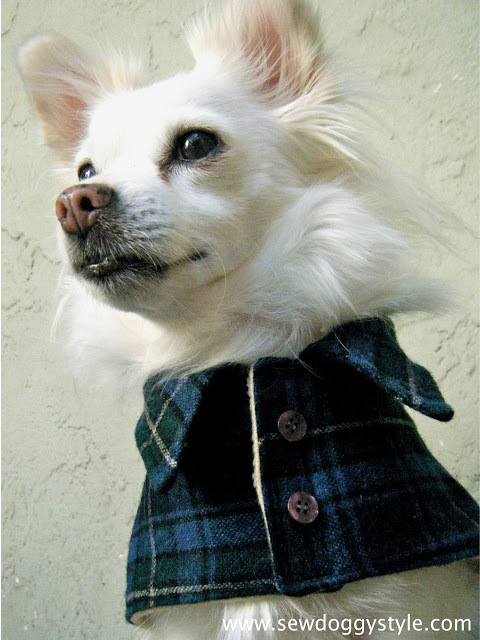 Turn a collared shirt into a dog coat! Measure your dog and use a piece of newspaper to make a pattern of the coat to the size needed. Use the template to cut out the coat pattern from the shirt and also from a piece of fleece or thick fabric lining. Cut off the shirt collar and pocket from the shirt, sew the collar and pocket onto the coat fabric and cut two strips of fabric from the shirt and lining for straps. Sew the strap fabrics together, sew the straps onto the coat fabric and place the lining on top of the outside of the coat to sew the lining onto the coat, leaving a hole to turn the fabric back out once sewn together. Sew faux buttons onto the straps and front of the fabric and attach pieces of Velcro along the edges.